The stunning sequel to Sarah J. Maas' New York Times bestselling A Court of Thorns and Roses and a No.1 New York Times bestseller. Feyre survived Amarantha's clutches to return to the Spring Court - but at a steep cost. Though she now has the powers of the High Fae, her heart remains human, and it can't forget the terrible deeds she performed to save Tamlin's people. Nor has Feyre forgotten her bargain with Rhysand, High Lord of the feared Night Court. As Feyre navigates its dark web of politics, passion, and dazzling power, a greater evil looms - and she might be key to stopping it. But only if she can harness her harrowing gifts, heal her fractured soul, and decide how she wishes to shape her future - and the future of a world cleaved in two. With more than a million copies sold of her beloved Throne of Glass series, Sarah J. Maas's masterful storytelling brings this second book in her seductive and action-packed series to new heights. 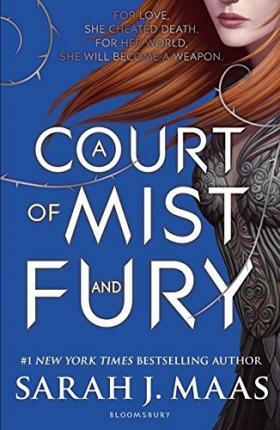 Older teens will love A Court of Mist and Fury. Contains mature content. Not suitable for younger readers. The stunning sequel to Sarah J. Maas' New York Times bestselling A Court of Thorns and Roses. Feyre survived Amarantha's clutches to return to the Spring Court - but at a steep cost. Though she now has the powers of the High Fae, her heart remains human, and it can't forget the terrible deeds she performed to save Tamlin's people. Nor has Feyre forgotten her bargain with Rhysand, High Lord of the feared Night Court. As Feyre navigates its dark web of politics, passion, and dazzling power, a greater evil looms - and she might be key to stopping it. But only if she can harness her harrowing gifts, heal her fractured soul, and decide how she wishes to shape her future - and the future of a world cleaved in two. With more than a million copies sold of her beloved Throne of Glass series, Sarah J. Maas's masterful storytelling brings this second book in her seductive and action-packed series to new heights. Sarah J. Maas is the author of the New York Times bestselling Throne of Glass series: Throne of Glass, Crown of Midnight, Heir of Fire, and Queen of Shadows, and the series' prequel, The Assassin's Blade; as well as the seductive New York Times bestseller A Court of Thorns and Roses. A New York native, Sarah currently lives in Pennsylvania with her husband and dog.